One of my favorite books growing up was “Tales of 1001 Arabian nights”. Scheherazade weaving her nightly tales filled with fantastical djinns, beautiful women, philandering spouses, wealthy merchants, poor beggars, and witty, courageous young men to appease the cruel shah and to win one more day of life. I was enchanted by Scheherazade along with the Shahryyar:- I felt the hot sand of the dessert while traveling with Alladin, the salty sea splashing on my face on Sindbad’s boat, the vibrant colors and the noise of ancient bazaars of Damascus, Baghdad, and Shiraz. I tasted the honeyed pomegranates, halvah and sherbet, smelled the scents of exotic spices. 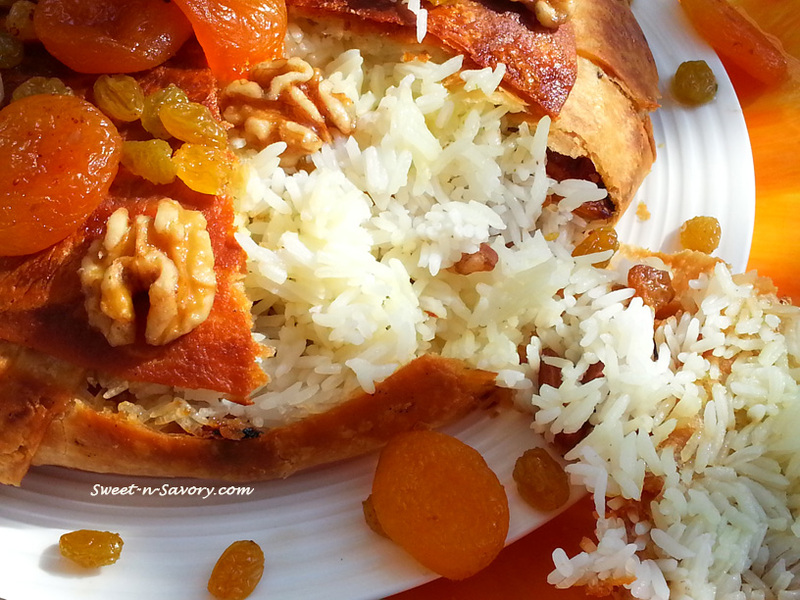 The food is interwoven into Shaherezade’s stories :- it is currency, temptation, sustenance, and I can imagine this plov being served to Shah himself at one of his feasts – Crunchy lavash shell, delicate flavor of safron infused rice, earthy taste of the nuts and the sweet and yet tart honey apricots, white raisins,and barberries, mmmm. Can you hear the girls of the harem stringing dulcimers? *Special Equipment:- you would need either a kazan, large non stick pot, a dutch oven, I have made this plov in a corningware round container as well, and come to think of it – a tall springform pan would work too. * Special ingredient :- lavash, its a very thin, long tortilla like bread. You can buy it in Russian grocery stores, Armenian stores, Trader Joe’s. Whole foods might have it. If you can’t find it – Use flour tortillas, however they are generally thicker than lavash, so keep it in mind. *Side note:- I am not claiming to have an authentic recipe for the plov, it’s my own rendition based on many other recipes found on the internet and on the plovs I have tasted in various cafe’s. The plov can be accompanied by meat or nuts with fruit as I’m showing here. Add saffron threads into a cup, add about 3 tablespoons of boiling water, cover the cup and let it steep while the rice is cooking. The longer you steep – the brighter the color will be. Heat a tablespoon of oil or butter in a saucepan, add about 1/4 cup of water ,fruit and nuts and simmer for a few minutes, until the fruit becomes plump. Brush the bottom and the sides of the pot with oil. 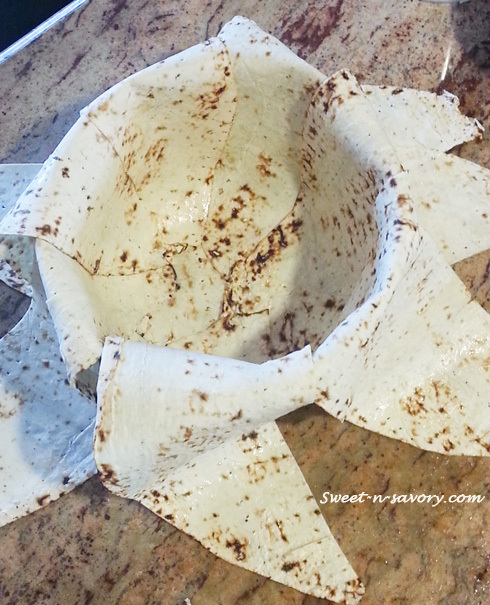 Cover the bottom of the pot with a round piece of lavash or tortilla,arrange the rest of lavash to cover the sides of the pot, overlap the pieces to avoid empty spaces. The enclosed space will help steam the rice, and its essential that the steam does not escape. Layer 1/3 of the rice, dot with butter or sprinkle with a teaspoon of oil, top with 1/4 of the nut and fruit mixture( save 1/4 of the nuts and fruit mixture for decoration) .Alternate the layers , Sprinkle the saffron infusion over the top rice. You can discard the saffron threads, but I like how they look in the rice. Shown here is the last layer, just before I added saffron, I also had a few extra pistachios left over, so I added them on top. 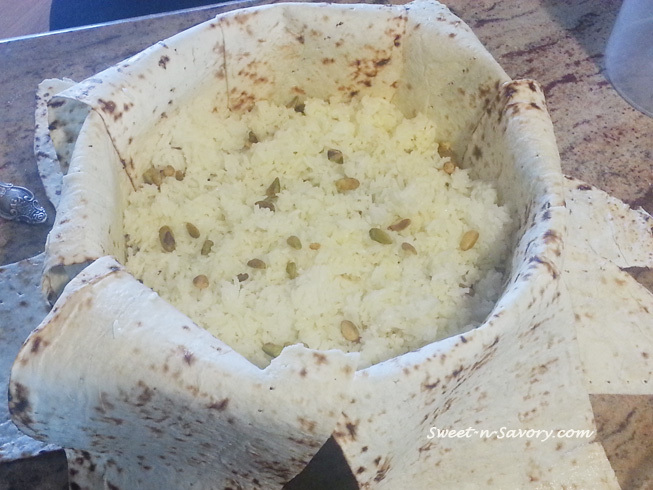 Cover the rice with lavash or tortilla, tightly and bake until the lavash is a golden brown. Let the Plov rest a little bit and then Invert onto a platter. 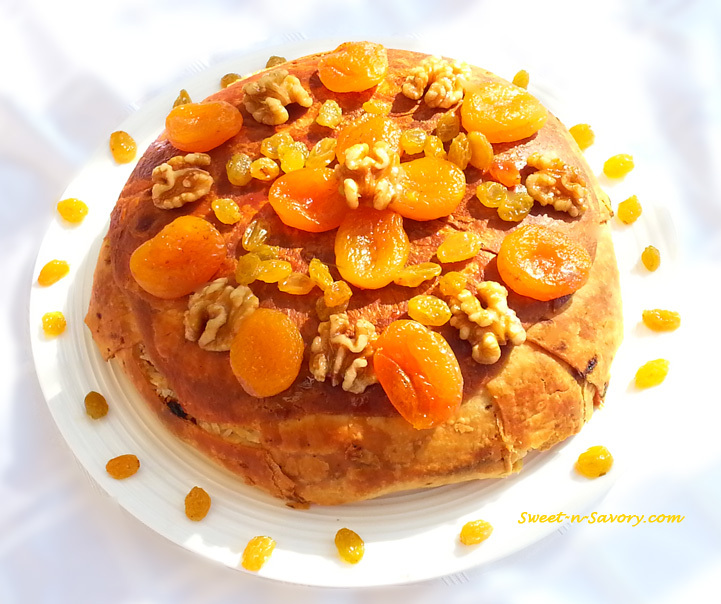 Decorate with the remaining nuts and fruit. To serve :- Cut the lavash from top into slices without cutting through the rice.